When Larry and I planned a trip to the Phoenix/Scottsdale area in Arizona, I expected spectacular desert scenery, breathtaking red rock mountains, and sunny Arizona weather. I wasn’t disappointed. All those natural features have spawned a huge community with world-renown golf courses and more resort spas than anywhere else in the country. But if luxury digs and lazy days aren't your travel style, there are many other options for exploring—and enjoying--the area. Taliesin West I’ve long been fascinated by the architecture of FrankLloyd Wright, so we took a 90-minute guided tour of Taliesin West, the home he built in the 1930s. Regarded as one of his greatest masterpieces and now a National Historic Landmark, Taliesin West was literally built out of the desert using rocks and sand to balance the design with the surrounding environment. 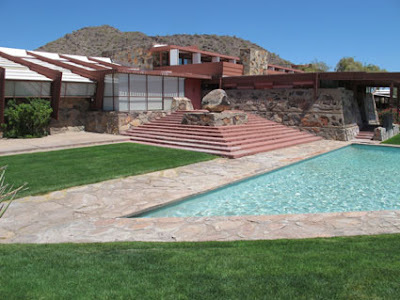 Taliesin West showcases the genius of architect Frank Lloyd Wright. Wright oriented his home to face the mountains and away from utility poles, which he disliked. He loved music—even had a wall cut out to fit a piano--and encouraged performances by visitors, a tradition that continues today among architecture students who come to study the master’s style. Musical Instrument Museum Whether you know much about music or not, this is a fun place to browse for a couple of hours. Opened in 2010, the museum’s exhibits display instruments from every country in the world, and videos provide musical sights and sounds from a variety of cultures. Learn about familiar and little-known instruments at MIM in Phoenix. Among the instruments on display in the museum are a side-blown trumpet from Tanzania, bowed lute from Madagascar, goblet drum from Turkey, kettle drum made from goatskin and wood from Chile, and a plucked zither from Syria. Guitars from the earliest models up to present day instruments were displayed openly, not behind glass. One of the tidbits we learned: Congo musicians who use bells and rattles to call up spirits for healing or protection are held in high esteem. 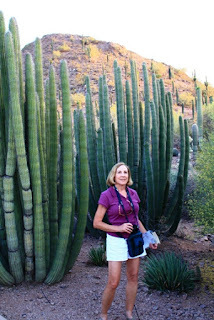 Desert Botanical Garden A visit to this vibrant garden quickly dispels the myth that deserts are barren and boring. Stunning specimens of pipe organ cacti, 100-year-old saguaros, and blooms emanating from thick stems in rainbow colors are displayed in 50 acres of beautiful outdoor landscaping. Nestled in the garden among the red buttes of Papago Park are 50,000 plants, 139 of which are rare, threatened, and endangered species. At every turn along five thematic trails there’s something new to see, whether it’s an unusual variety of succulent, one of more than a hundred bird species, or a half-century-old turtle crossing the path. Hot air balloon ride It’s a bit of a splurge and you have to get up early, but the sunrise flight is totally worth it. After arriving at the launch site, we watched as workers inflated the giant balloon before climbing into the attached basket. 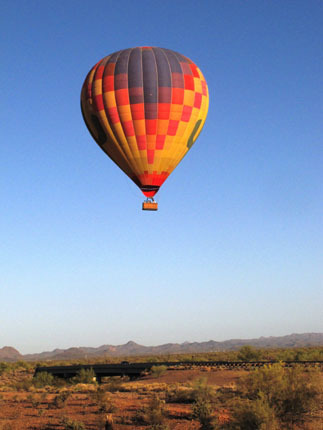 Up we drifted, tranquilly soaring above the Sonoran Desert in the 12-story-tall apparatus. over the Sonoran desert near Phoenix, Arizona. Despite cracking us up with his crazy jokes, our captain masterfully monitored air currents to raise the wicker basket 8,000 feet above earth. Although the balloon travels around five miles per hour, there’s little sensation of motion. Along the way, we had unobstructed views of scampering jackrabbits, scattered cacti, shrubs, and trees, and even shadows from our own balloon.